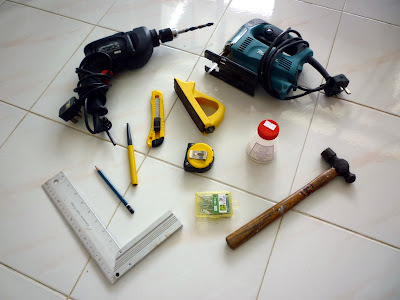 Tools need for assembling the model. The nails should be 16mm pins made of stainless steel. If these are not available, then galvanised nails, know locally as ..... are a good second choice. Steel nails rust very quickly, with the rust discolouring any subsequent paint covering. This is particularly true since we will be using water based emulsion paint to finish the models basic shell. The glue is acrylic, also know as white glue. Most hardware stores will stock these items.